Join Summit Pacific Medical Center in fighting hunger and spreading holiday cheer this season! The team at Summit Pacific is selling Holiday Meal Packs for donation to local families in need and YOU can help. Meal Packs can be purchased in Café Salute, located within Summit Pacific Medical Center, or you can donate online below. 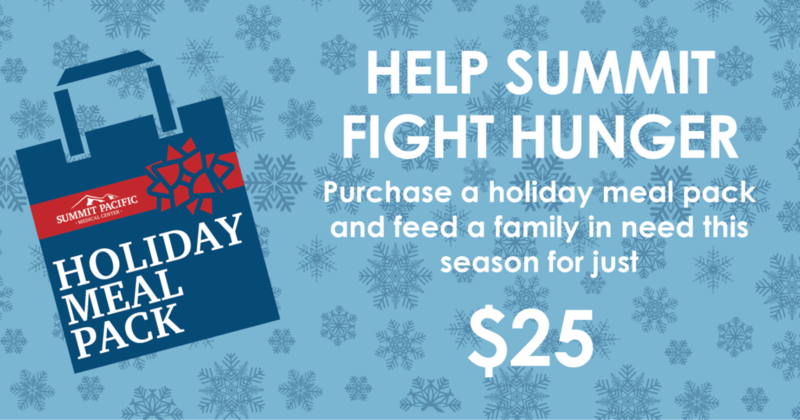 When you make a purchase, we will add your name to one of our Holiday Meal Pack badges to display in the café to let others know you are committed to fighting hunger in our community. Holiday Meal Packs are only on sale through Monday, December 17. Thank you for helping us serve the community!